Lifts So Close You Feel Like You Can Touch Them, 3 Bedrooms, 7th Floor Corner, Private! If you're looking for a great (and cheap!) hotel in Winter Park (ski area), CheapTickets is the best place to find them. We offer deals on the best 89 hotels throughout Winter Park (ski area). No matter what you're looking for, we have options for you. Grab great rates on the 61 affordable 3-star hotels that are easy on the wallet without sacrificing comfort. Looking for more luxury? Try one of the 2, 4-star hotel accommodations in Winter Park (ski area). No matter your budget needs, we've pulled out all the stops to make sure you have plenty of vacation options. Maybe you prefer to search for your hotel deals based on what each hotel offers? For example, let's say you just want to find a hotel or resort that has a pool to cool off in after a long day exploring Winter Park (ski area). Scroll down to choose from the 6 hotels in Winter Park (ski area) that has a pool for guests. Or search for deals on Winter Park (ski area) hotels offering free wifi or breakfast, non-smoking rooms, and more! CheapTickets is here to be your personal travel agent for your next trip to Winter Park (ski area). Get booking today! What hotels in Winter Park (ski area) offer free wifi access? Are there deals on Winter Park (ski area) hotels offering free breakfast? Yes! The only thing better than finding a great deal on a cheap hotel in Winter Park (ski area) is finding one that offers free breakfast. Grab some eggs, a waffle, or some healthy oatmeal before a day full of exploring Winter Park (ski area) and all that it has to offer. Below are just some of the many hotels that offer free breakfast in Winter Park (ski area). Valley Hi Motel is a 2.00 star rated hotel property in Winter Park (ski area) that offers free breakfast. Best Western Alpenglo Lodge is a 2.50 star rated hotel property in Winter Park (ski area) that offers free breakfast. Americas Best Value Inn Sundowner Motel is a 2.00 star rated hotel property in Winter Park (ski area) that offers free breakfast. What about deals on pet-friendly hotels in Winter Park (ski area)? Winter Park (ski area) is a great place to get outside and explore with your pets in tow so don't leave your furry friends behind. Below you'll find great deals on hotels in Winter Park (ski area) that allow pets. Don't forget to bring plenty of treats! 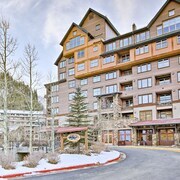 Hideaway Village is a popular, pet-friendly, 2.50 star hotel in Winter Park (ski area). Americas Best Value Inn Sundowner Motel is a popular, pet-friendly, 2.00 star hotel in Winter Park (ski area). Best Western Alpenglo Lodge is a popular, pet-friendly, 2.50 star hotel in Winter Park (ski area). The Viking Lodge and Ski Shop is a popular, pet-friendly, 2.00 star hotel in Winter Park (ski area). Any good rates on Winter Park (ski area) hotels with restaurants? Absolutely. 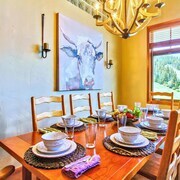 Don't want to deal with planning our all your meals on your trip to Winter Park (ski area)? We don't blame you. Keep the hangry away by staying in one of the 2 hotels that have restaurants. With a room at one of these spots, all it takes to get a good meal is hopping in the elevator. Check out some of the most popular hotels in Winter Park (ski area) that have restaurants below. Book Vasquez Creek InnVasquez Creek Inn is a 3.50 star hotel and has one or more restaurant options. Book Hi Country HausHi Country Haus is a 2.50 star hotel and has one or more restaurant options. What are the cheapest hotels in Winter Park (ski area) with pools? What's better after a long day exploring Winter Park (ski area) then a relaxing dip in a pool? Finding the Winter Park (ski area) hotel you need for a bargain! Cool off and unwind at one of our 6 Winter Park (ski area) hotels with a pool. Browse some of the top deals on these hotels and resorts with pools in Winter Park (ski area) below, but be warned: You may not want to check out! Hi Country Haus has a pool and a 2.50 star rating. Trailhead Inn has a pool and a 2.50 star rating. Silverado II Resort & Event Center has a pool and a 3.50 star rating. 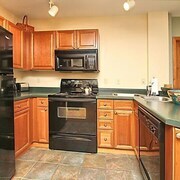 Beaver Village Condos by Staywinterpark has a pool and a 3.50 star rating. What hotels in Winter Park (ski area) offer parking for guests? Once you've made your way to Winter Park (ski area), the last thing you want to deal with is finding parking close to your hotel. Avoid the hassle of parking around the block and carrying your luggage all the way to the lobby by booking one of our hotels with parking. Check out deals on some of the 13 hotels in Winter Park (ski area) that offer parking for guests. Sawmill Station This hotel has a 3.00-star rating. Winter Park Chateau This hotel has a 3.50-star rating. Crestview Place This hotel has a 2.00-star rating. Hi Country Haus This hotel has a 2.50-star rating. 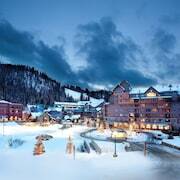 Do Winter Park (ski area) hotels offer 24-hour concierge services? When you're on vacation, things don't always go according to plan. Travel with peace of mind when you book one of our 9 hotels in Winter Park (ski area) with 24-hour concierge service. That way you know help is always phone call or elevator ride away. Try Valley Hi Motel. 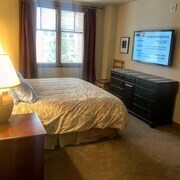 It's a 2.00 star rated hotel in Winter Park (ski area) that offers concierge services 24 hours a day. Try Vasquez Creek Inn. It's a 3.50 star rated hotel in Winter Park (ski area) that offers concierge services 24 hours a day. Try Hi Country Haus. It's a 2.50 star rated hotel in Winter Park (ski area) that offers concierge services 24 hours a day. Try Beaver Village Condos by Staywinterpark. It's a 3.50 star rated hotel in Winter Park (ski area) that offers concierge services 24 hours a day. What about low rates on non-smoking hotels in Winter Park (ski area)? Hideaway Village This hotel has a 2.50-star rating. Vasquez Creek Inn This hotel has a 3.50-star rating. The Viking Lodge and Ski Shop This hotel has a 2.00-star rating. Americas Best Value Inn Sundowner Motel This hotel has a 2.00-star rating. What are the cheapest Winter Park (ski area) 3-star hotel deals? Our 3-star hotels bring you quality accommodations at a lower price point for the perfect, budget-friendly vacation in Winter Park (ski area). With 61 3-star hotels throughout Winter Park (ski area) to choose from, you still have options. Browse our selection below. Beaver Village Condos by Staywinterpark. Conveniently near skiing facilities, this Winter Park condo is located in the mountains, within 3 mi (5 km) of Winter Park Visitor Center and Winter Park Ski Resort, and close to winter sports such as cross-country skiing and skiing lessons. Grand Park Community Recreation Center and Cozens Ranch House Museum are also within 2 mi (3 km). Silverado II Resort & Event Center. Situated in Winter Park, this ski condo is within 1 mi (2 km) of Winter Park Visitor Center and Grand Park Community Recreation Center. Cozens Ranch House Museum and Fraser Tubing Hill are also within 3 mi (5 km). Winter Park Chateau. Situated in Winter Park, this bed & breakfast is within a 15-minute walk of Winter Park Visitor Center, Grand Park Community Recreation Center, and Cozens Ranch House Museum. Fraser Tubing Hill and Colorado Adventure Park are also within 3 mi (5 km). Vasquez Creek Inn. Conveniently near skiing facilities, this Winter Park inn is located in the mountains, within 3 mi (5 km) of Winter Park Visitor Center and Winter Park Ski Resort, and close to winter sports such as cross-country skiing and skiing lessons. Grand Park Community Recreation Center and Cozens Ranch House Museum are also within 1 mi (2 km). What are the best deals on 4-Star Hotels in Winter Park (ski area)? 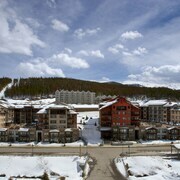 Winter Park (ski area) is full of hotels and it can be hard to narrow down where you really want to stay. Luckily, we've done that hard work for you be narrowing you from 89 hotels throughout Winter Park (ski area), to the 2 4-star hotels in Winter Park (ski area). Our 4-star hotels in Winter Park (ski area) are exactly what you need for your next family trip, romantic weekend, or solo getaway. Check out our most popular deals below. Reasonable price for a ski area at WP, but you require ground transportation to get anywhere, and it did not work well for us. Buses were not running on much of a schedule or were late. It looks from an aerial photo like you could walk to the lifts, NO, you definitely can't get there, you have to use buses. We found the ski resorts own shuttles unreliable or unpredictable, and the "Green line" not on a very good schedule and does NOT run late if you want to go to/from the base village after hours. the lodge picked us up at the Amtrak Fraser station and was wonderful about that, but the lodge itself does not offer transportation to the village base area/ski lifts. Plan to allow extra time to get to/from lifts. It was nice because it was all self contained- no reason to leave village. Amenities were great, but could use more, specifically, another hot tub since the only one on site was really busy. Also, parking garage and reservation wasn't very user friendly. The room however was great and location was even better. The best thing about the room was the bed and pillows...super soft and comfortable. The fireplace was a nice touch as well. Just got homr from 3 nights with my three 20 something year olds and had a great experience. Walk to everything! Skiing was foot steps away! Wr absolutley recommend. Only downside: I asked for mountain view. They said our condo faced the village and it actually faced the parking garage. No air conditioning, but we didn't really need it. Great hotel in a great location. Staff was excellent. Hip & Modern To Boot, Plus WP Mountain Views From Balcony! Situated on the 4th Floor, Condo has Oversized Bedrooms, Sleeps 8!